We start with a view below of the central part of Grand Canyon, standing on the South Rim (not far from the hotel complexes) at about 7,000 feet elevation looking across toward the North Rim (8,000 feet, a product of the upward-bulging shape of the Colorado Plateau at this point). 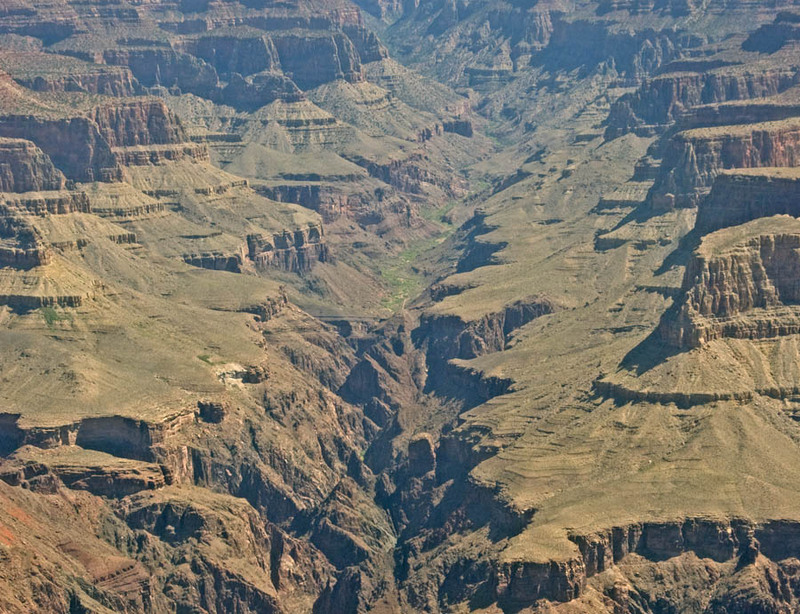 The general flatness of the Colorado Plateau, however, is what stands out in this image, and it is directly paralleled by the many layers of rocks exposed within it. This plateau was a flat, more or less low-lying plain for some 500 million years, which rose and fell, and was inundated repeatedly by seas (and seashore areas) that deposited most of the sediments that now form these layers. Much later, when the plateau was uplifted and the Colorado River started cutting through these layers some 5 million years ago, the stream encountered these horizontal strata of varying hardness and accordingly carved alternating vertical cliffs and slanting slopes of canyon. Here the visually most striking vertical layers are the whitish Coconino Sandstone formation toward the top (deposited as windblown sand, of Early Permian Age, 275 mya ("million years ago"), toward the end of the Paleozoic Era), and the Redwall Formation toward the bottom (limestone laid in a shallow tropical sea, of Mississippian age 340 mya). These are major visual markers all across the Canyon. The Redwall in particular forms a major barrier to vertical travel throughout the Canyon. The side-canyon at far left running from the bottom to top in the image is Bright Angel Canyon; in this photo, the Colorado river runs from lower right to lower left (east to west) but out of sight below us here. The "Red Wall" Formation is actually composed of dark brown to bluish gray limestone (but has been stained red by water dripping from the iron-rich beds above it), and contains many fossils of complex marine organisms from that time. In the discussions to follow we insert links to geo-historical maps reconstructing various time periods; here is our source: Paleogeography of the Southwest. Below, the Redwall forms the prominent vertical flanks of the Bright Angel Trail Canyon (we're looking toward the north from across the south rim of the main Canyon), while the more sloping, older formations (here mostly a pale greenish-tinted), called the "Tonto Group", date from the Cambrian Period (the very beginning of the Palaeozoic Era, beginning some 540 Million years ago), At the bottom of these slopes stand another layer of vertical cliffs (above still lower, darker rocks that slope toward the bottom) called the Tapeats Formation, the oldest Cambrian layer found in the Canyon. Tapeats Sandstone averages 525 million years old and is made of cliff-derived medium- to coarse-grained sand and conglomerate that was deposited along an ancient shore. See the following link for a map reconstruction of our area in Cambrian times: Cambrian Southwest. Note how the Tapeats in some places almost seems like a (very thick) carpet draping itself over these lower, much more ancient rocks. More about the "basement" rocks shortly. Below, this view of what is called "Buddha Temple" nicely illustrates the sequence of formations between the Redwall (at image bottom) and the Coconino formations (the whitish rocks of the cap below the Temple's capstone, and behind that its contemporary cohorts like an echoing band further across the Canyon). This reddish, sloping, intermediate series between those two is called the Supai Group, deposited in both marine and non-marine muds, silts, and sand on a broad coastal plain similar to the Texas Gulf Coast of today during late Mississippian, through the Pennsylvanian and into the early Permian time, some 320 million to 275 million years ago. Much of this is iron-rich sandstone and siltstone. See this map-link: Mississippian. 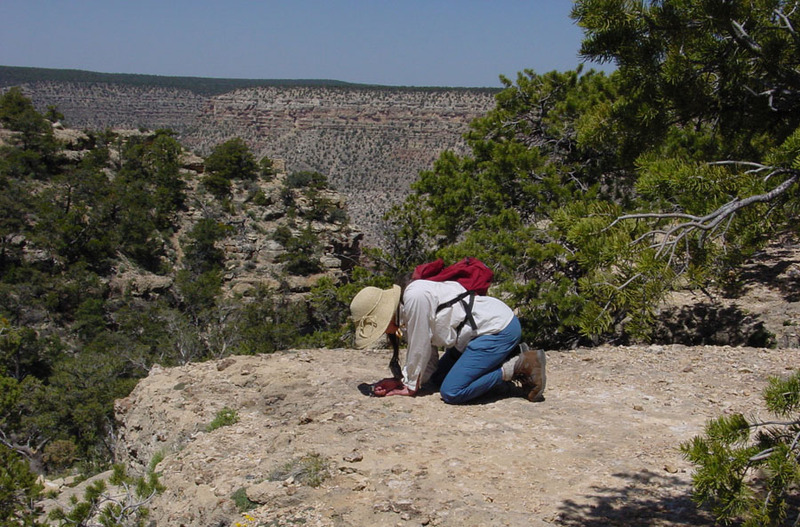 Below, here we look at nearby formations on the south rim, a series lying above the Coconino and of later Permian age than that desert-environment landscape. These rocks are of varying hardness, including the lower edgy-or-sloping forms in the mid-distance, the Toroweap Formation, deposited in a warm, shallow sea as the shoreline transgressed (invaded) and regressed (retreated) over the land. It consists of red and yellow sandstone and shaly gray limestone interbedded with gypsum. 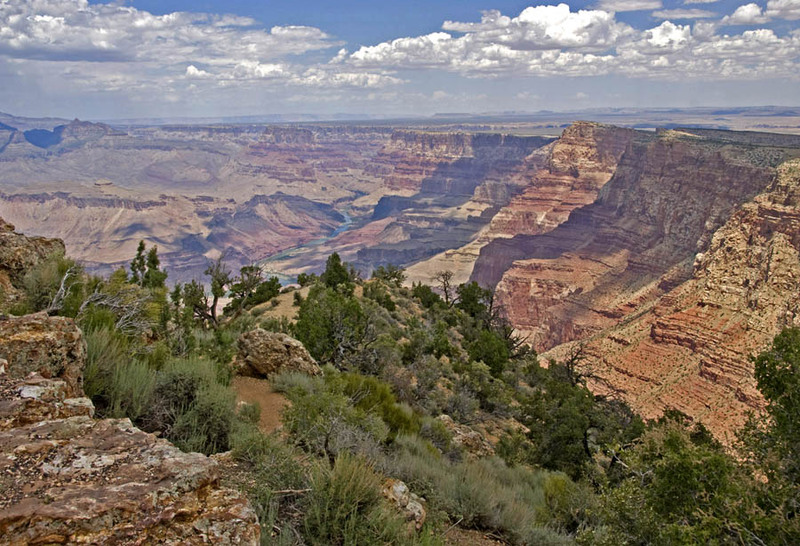 The topmost formation in most of the Grand Canyon is the Kaibab Limestone visible here in the foreground, laid down in latest early Permian time, about 270 million years ago, and in deeper parts of the same advancing warm, shallow sea where the underlying Toroweap was formed. 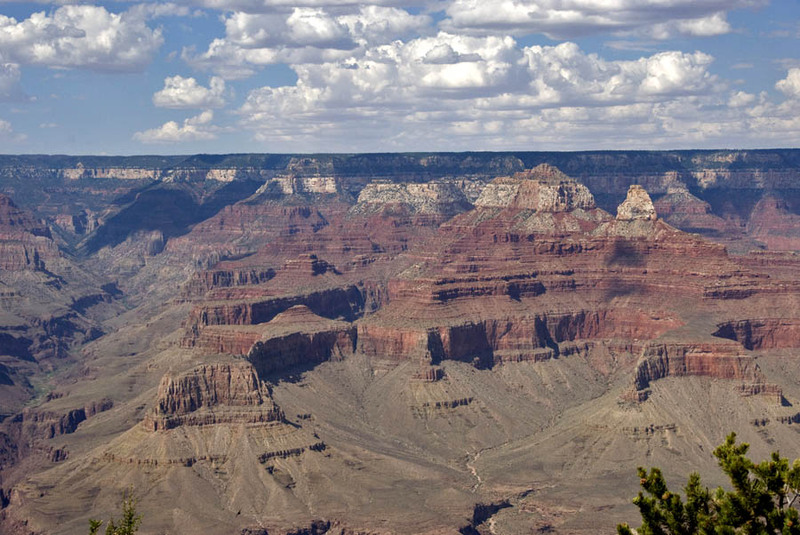 The formation is of sandy limestone, sandstone, and some shale, and is the cream to grayish-white rock that park visitors stand on while viewing the canyon from both rims. 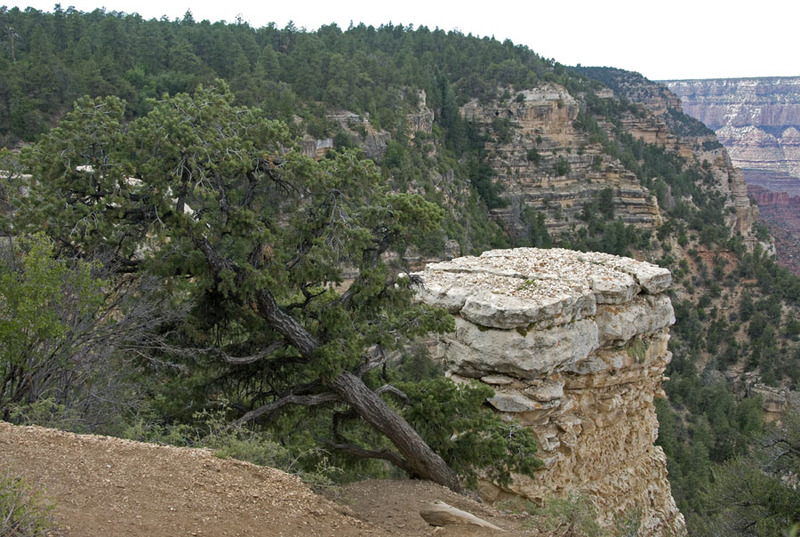 It also covers much of the Kaibab Plateau just north of the canyon and the Coconino Plateau immediately south. Abundant fossils of marine invertebrates and sharks teeth are found here. For a map sequence of the Permian in our area, see Permian Southwest. Thus from the base of this entire image below (Tapeats Sandstone, the cliffs at the very bottom from the Cambrian Paleozoic) to the top (Kaibab Limestone,toward the end of the Permian Paleozoic), we see a series of sequential layers starting from somewhere near 545 Million years ago to 270 Million years ago, approaching the time of the Great Permian Extinction of 250 Million years ago. 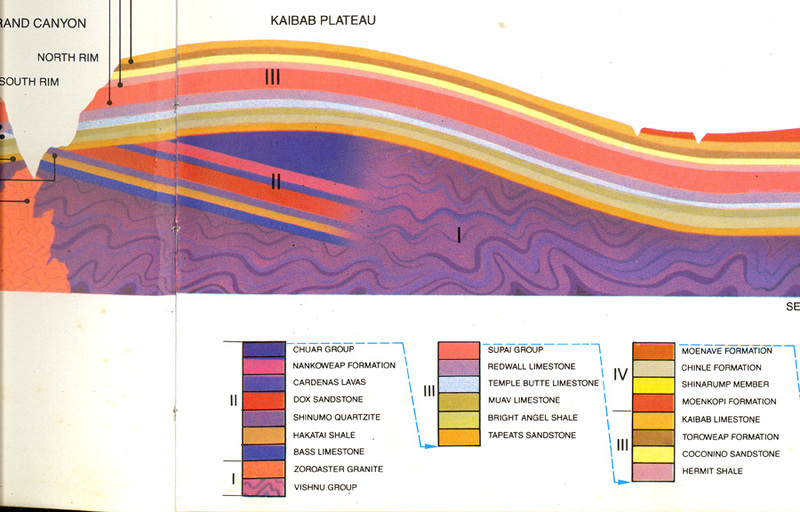 Of course, there are great gaps marked by sharp unconformities (discontinuities) between the various layers, the time sequence is very incomplete. These gaps in time-and-deposits are nicely illustrated in the diagram below, drawn from Ron Redfern's remarkable book, Corridors of Time (Times Books, 1967). (While Redfern does not use some of the more recent group namings, and some details may be different in light of today, the overall picture still seems roughly OK.) The size of time gaps between deposition of strata are indicated by the blocks on the left hand side of the figure (reflecting periods when the Plateau was eroding instead of depositing strata). 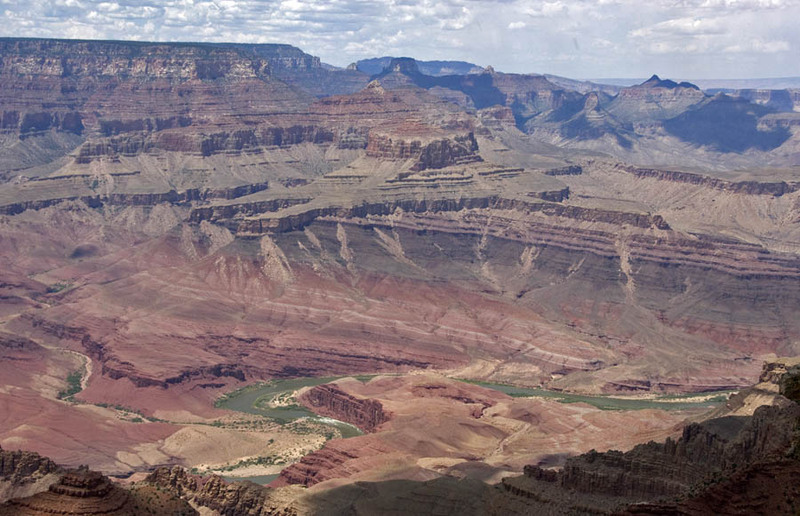 The biggest gap in this part of the Grand Canyon's record is that between the Tapeats and its associated Cambrian deposits and the Redwall complex directly above it, an absence of deposits throughout the Ordovician and Silurian periods. There are numerous other gaps in the geological record above it. Still, it's an amazing history book of the Paleozoic Era, and it shows a Plateau that rose above and below sea level during all those times. Now we look more deeply into the Canyon, into the layers below the Tapeats blanket. Here below, we turn our view toward the west and further downstream. Here the canyon has cut into the deepest layers of Arizona's geological history, into the Vishnu Schist (and its associated igneous and metamorphic structures), a gash of (in this darker, altered light) almost blue-black rock with the Colorado River running through it. It makes the sharpest contrast with the pale great Tapeats blanket edging its depths(and also with the gorgeous slash of bright-red Redwall in the lower foreground). This is what geologists today call a "Metamorphic and Igneous Basement", the names now given to these rocks including the metasedimentary Vishnu Schist and the metavolcanic Brahma and Rama Schists. All were formed in remote Precambrian time when, approximately 2 billion years ago, many thousand feet of sediments and volcanic material were deposited on the sea floor. These sediments were metamorphosed during a mountain building episode 1.7 billion years ago. The rocks were folded, uplifted, and intruded by granites (Zoroaster Granite), resulting in the formation of a mountain range that is believed to have been 5 to 6 miles high. Between 1.7 and 1.2 billion years ago, these mountains were eroded till only the roots remained, the rocks were buried many miles under the surface and pressure-cooked into metamorphic rock. No fossils have been found in these schists, but lenses of marble in them likely derive from colonies of primitive algae. Below, a closeup view of these ancient schists, with intrusive volcanic dikes and lenses of various kinds contained within them. (Note huge blackish vertical dike near dead center, partly in shadow.) The vertical inclination of the strata suggests that they once formed part of a great mountain complex, later leveled quite flat, into a "peneplain". Following an unimaginable time interval of erosion, the tapeats blankets were deposited atop them some 545 Ma. Now, when we turn away from the area near the Grand Canyon Village, and move toward the eastern part of the south rim, near "Desert View", we see the same formations as previously, except that the Vishnu Group disappears (now lies unexposed), but some quite different formations now become visible toward the canyon bottom. Below, the stretch of flat green plateau running across the upper-right portion of the image, which lies atop the late-Permian Kaibab Limestone we have already discussed, is part of the Western extension of the Painted Desert (with its deposits of post-Grand Canyon strata Triassic time, and famous for its petrified forest remains). 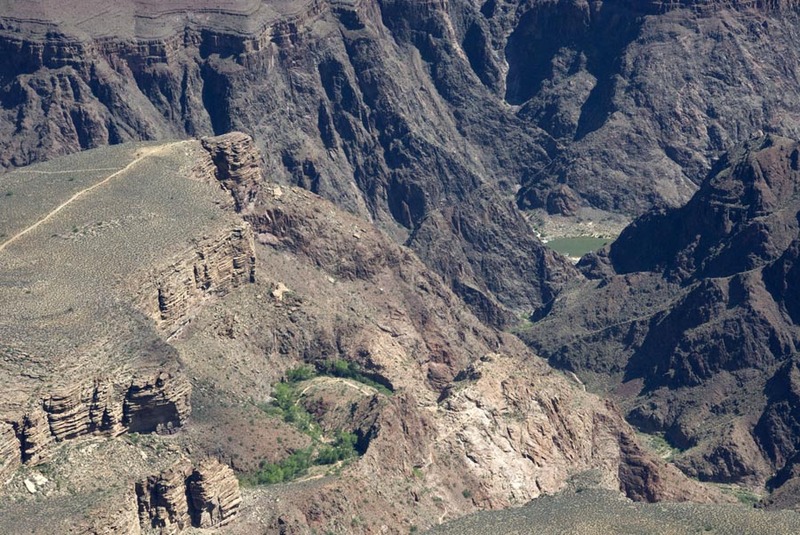 The Little Colorado River has passed through those strata and then cut its own canyon route to meet the Colorado River (the Little Colorado channel is visible along the plateau just above the line of Grand Canyon cliffs to the right). 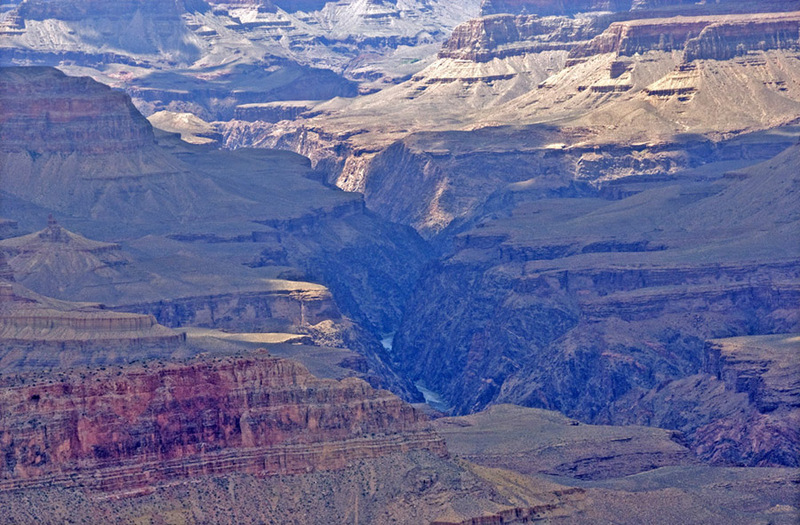 In the upper center of the image, the so-called "Pillars of the Desert", line the Grand Canyon entry with cliffs whose Kaibab Limestone are visible on top, running northward along the east side of the river toward Lees Ferry and the bridge-crossing on Highway 89A). As the Colorado River, previously running southward, turns west past this confluence, it cuts through our now-familiar old Cambrian Tapeats Sandstone (here the blanket appears covered in buff color at upper-middle left) to reveal a lower series of strata, mostly reddish but also with stretches of black, the whole series tilted at around 15 degrees from the horizontal, in contrast with the near-horizontal disposition of all the rocks lying above. Below you see in greater detail these lower-level tilted strata, which meet the much later Tapeats Formation at a sharp unconformity. Called the "Unkar-Chuar Group" by Redfern in 1967, they are now the "Grand Canyon Supergroup", and were deposited as sediments much nearer to horizontal, some 1200 to 800 million years ago when an earlier sea covered the area. Then Mountain building 800 million years ago, characterized by normal faulting, resulted in a basin-range-like series of faulted mountains and valleys. 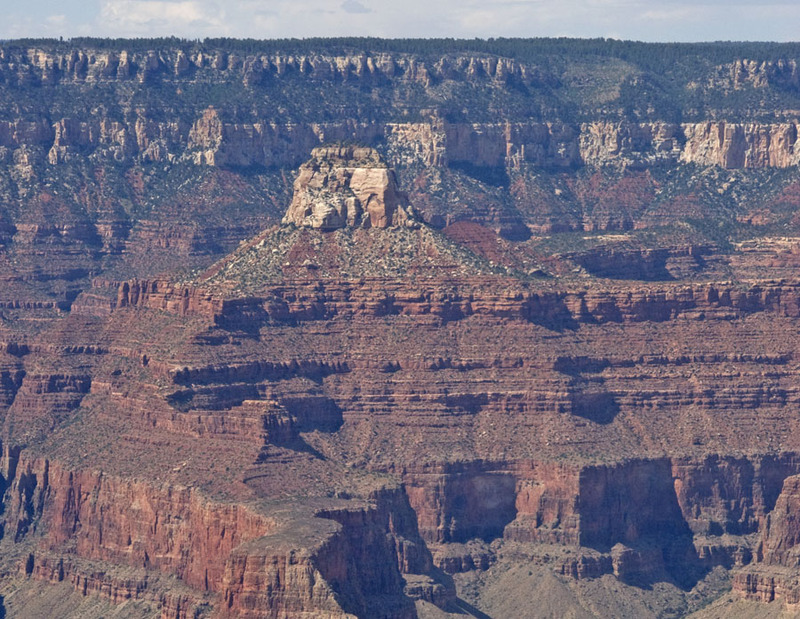 Subsequent erosion removed most of the Grand Canyon Supergroup except where it was down-dropped in one of the fault blocks. These mountain ranges were then eroded away flat, rather like the older (Vishnu) complex previously described. Another great unconformity intervened before the Tapeats Formation and later Paleozoic rocks were laid atop them. All the red-to-pink and gray-to-charcoal-colored strata you see below the Tapeats capstone (mid-image) toward the bottom of the image (beyond the foreground) are members of this group. The Redwall Formation is again striking in its position above the Tapeats here. 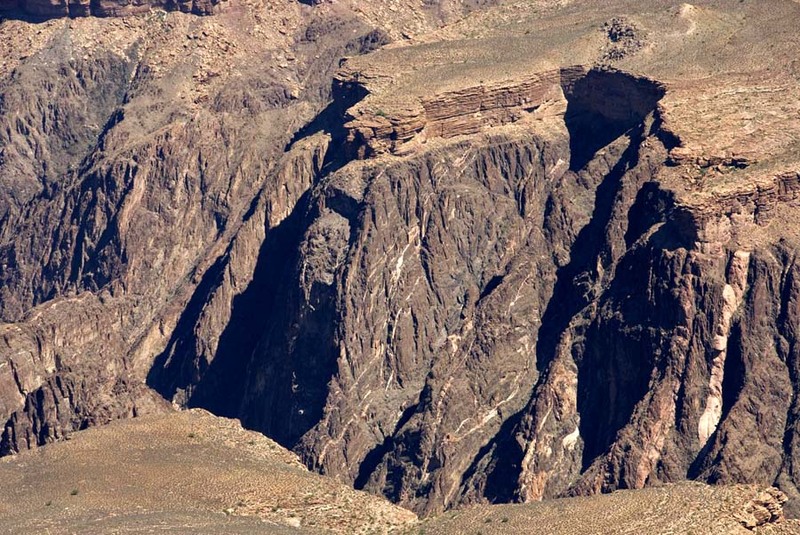 Below, here is another view of Grand Canyon Supergroup Formations, again contrasting sharply in both tilt angle and color with the greenish Tapeats formation that overlies them. (Because this photo was steeped in shadow, we have made strong Photoshop corrections in order to sharpen the eye's perception of the tilting strata.) Note the color striations in the Supergroup members visible at lower middle in the photo. Note also the much darker tilted formation above these at right-center. All of these sedimentary layers were laid down from 1.25 billion and 740 million years ago in extensive seas, the oldest exposed layer of the "Unkar Group" being a grayish formation deposited in a shallow sea near the coast as a mix of limestone, sandstone, and shale. Averaging 1250 million years old, this is the oldest layer exposed in the Grand Canyon that contains fossils (stromatolites). Other layers include thin beds of marginal-marine-derived mudstones, sandstones, and shales that today are very bright orange-red, an ocean-derived sandstone with some interbedded shale beds and mudstone), a lava made of layers of dark brown basaltic rocks that flowed 1100 million years ago. All members of the "Chuar Group" were likewise deposited in coastal and shallow sea environments. (Note that at the very bottom of the canyon toward the left you can see the Vishnu Schist et al complex underlying the Supergroup tilted strata.) 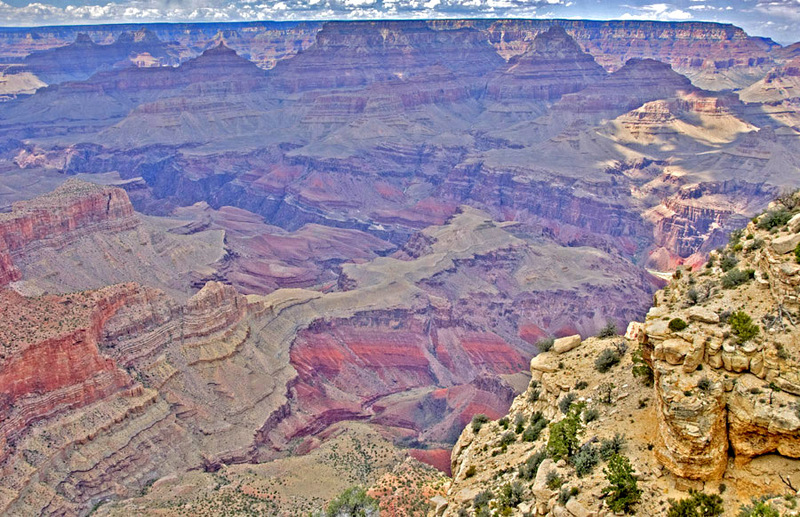 Note also how the North Rim of the Canyon looms above and beyond at the far horizon. Think of how this entire region accelerated its uplift en masse, beginning 5 million years ago, giving the river now starting to run across it much more energy (and work to do). It then proceeded to reveal to us these long-buried gelogical secrets. We now turn toward the wider geological context of the Grand Canyon, toward the next stages of our trip: Zion and Bryce National Parks. Again we use Redfern's diagrams, in which the one below shows the strata from south on the left (the south rim of the Grand Canyon) to north toward the right, where the light-red formation appearing only at top far right marks the lowest Mesozoic Era (248-65 Million years ago) stratum found in this area, the Moenkopi Formation of Early Triassic times. 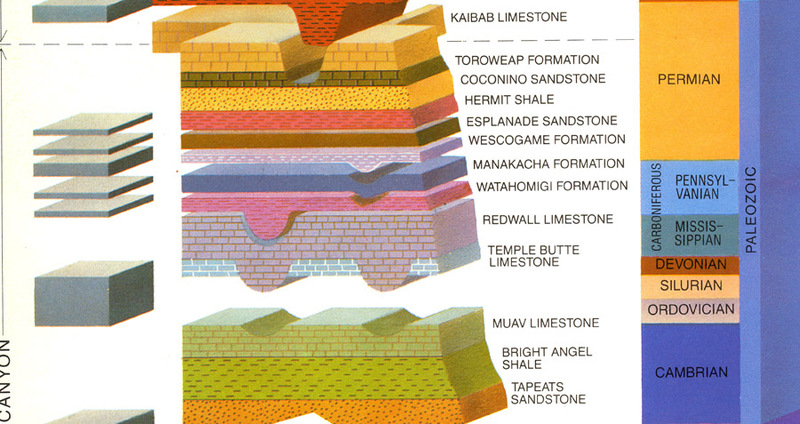 As you can figure from the key at the bottom of the diagram, the label "I" refers to the ancient Vishnu Group of formations, "II" to the later PreCambrian strata of the Grand Canyon Supergroup, "III" to the Paleozoic formations, "IV" to Mesozoic layers, toward which our geological tour now turns.